As a teenager I discovered the writing of James Baldwin. His novels, plays, and essays fictionalized the fundamental intricacies of a mid-century America teeming with racial, sexual, and class distinctions. Individuals were placed in the context of complex social pressures which seemed to thwart their integration at every turn. Young and confused myself, I ate it up: Giovanni’s Room, Go Tell It on the Mountain, The Fire Next Time, Another Country, and Blues for Mr. Charlie – works saturated with outrage, unrest, and a melancholic disappointment founded on a promise left unfulfilled. Yet one book has remained on my bookshelf unopened for some twenty-plus years: If Beale Street Could Talk. I’m not exactly sure why it’s gone unread for so long but that’s going to have to change after this trip. 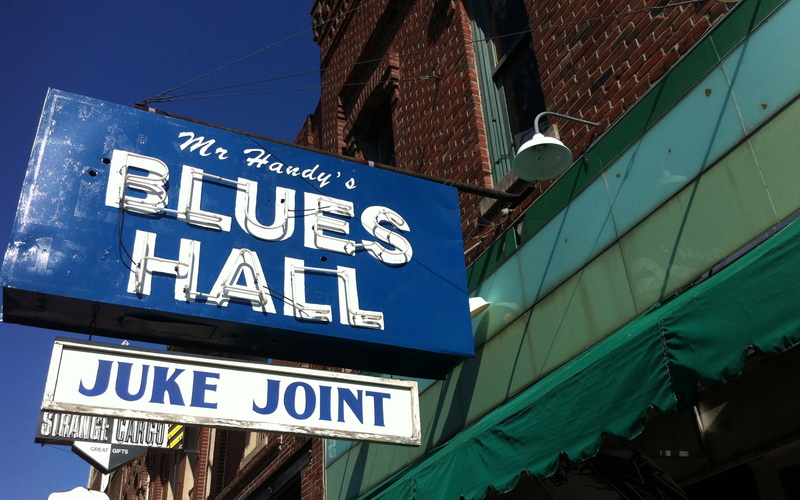 Beale Street was once the lifeblood of Memphis’ African American community, a National Historic Landmark and Home of the Blues. To quote B.B. King, “When you walked down Beale Street, you felt you really had something. Because you could get work on Beale Street. You could get justice on Beale Street. You could get whatever was available to people on Beale Street.” Martin Luther King, Jr.’s assassination near Beale Street, however, and the unrest that followed hastened the street’s decline. By the early 1970’s a disastrous experiment in urban renewal cleared most of the area’s old buildings to make way for a projected renovation that never materialized. I can only imagine how Baldwin would have reacted to such a scenario. Today, Beale Street is at the center of an economic revitalization happening all around downtown Memphis. The juke joints are once again lively and the food is too. Blues fills the air like a trumpet of triumph, not tragedy; making me wonder all the more what tales this street might tell, if only it could talk.